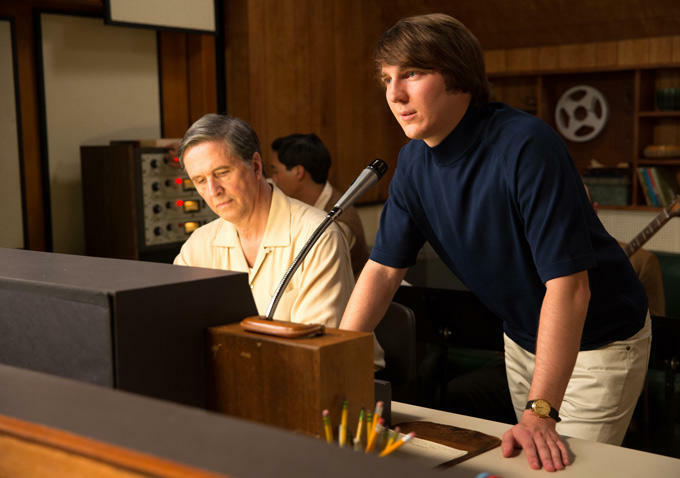 Brian Wilson (Paul Dano) of the Beach Boys is creating some brilliant music in the 1960’s. After they have become one of the most popular bands of the period with many mainstream hits, Wilson focuses on more experimental music. The album Pet Sounds becomes a cutting edge project, with Wilson trying to create the rich sounds that he constantly hears in his head. However, it’s clear Wilson is not only inspired by the sounds in his head, but is suffering from it. Fast-forward twenty years later and Wilson (John Cusack) is in the care of a shady therapist Dr. Eugene Landy (Paul Giamatti). Unable to function on his own, Landy had become a domineering caretaker that Wilson is unable to leave. It’s only when Wilson meets Melinda Ledbetter (Elizabeth Banks) where he may have found someone who will save him. I was never a huge Beach Boys fan. Of course I knew their popular songs – some of them it felt like I heard them more than I ever wanted to. I only vaguely knew about Wilson’s mental problems, but never knew the whole story or the details. So Love and Mercy was an eye-opening story to watch. It’s something of a strange bio-film the way it’s constructed by director Bill Pohlad. Two halves in two different time periods with the two different actors playing the character. And it works. Dano is the young Wilson while enjoying great success with this brothers during their Beach Boys peak. Yet there’s growing drama between Wilson and his stern father, the Beach Boys themselves who are having a hard time understanding Wilson’s approach to creating music and the demons inside Wilson’s head that’s causing a growing paranoia within him and soon a mental break. The period detail and studio sessions are all well done. And the film really began to enlighten me as to how complex and revolutionary Wilson’s approach to the music he helped create. The film certainly made me appreciate the Beach Boys sound much more than I had previously. The latter section of his life delves into the bizarre lifestyle of Wilson’s – now in the form of Cusack – who appears to be more of a prisoner of Dr. Landy’s than a patient. It’s such a strange relationship that initially I though the film was overplaying it for dramatic effect. But after watching the film I learned it was true and accurate to the stranglehold Landy had on Wilson in all aspects of his life. Cusack and Banks make a believable couple and at a point I was hoping they could overcome all the obstacles that were laying ahead of them with Wilson’s illness and Landy. There was some criticism at the casting of Cusack who looks nothing like Wilson, but that didn’t bother me at all. He’s actually very good in this. Better than I had seen him in a long time. It’s a not a showy performance, but more subdued and soft spoken. He’s almost like a corner frightened animal. Dano is equally good as the young Wilson. He has these great moments of joy in the studio when he finally manages to recreate the music in his head and then this growing torment as the sounds surround him. This movie caught me off guard. I wasn’t expecting to get so wrapped up into it. I hadn’t heard very much about it before watching it, but it ended up as a nice surprise.